Private 32988 4th Bn. 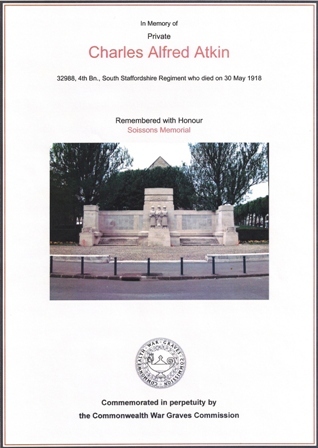 South Staffordshire Regt. Commemorated at Soissons Memorial, Aisne, France. Memorial Ref. : Stone No 19. B.
Charles Alfred Atkin was the second son of Henry Atkin & Fanny Atkin nee Auckland. Charles’ father, Henry, was a railway signalman, originating from Loughborough. His mother Fanny was born in Lincolnshire, as was Charles’ elder brother Harry. By 1891 the family was living in New Westwood and remained there until at least 1915, moving some time later to School House on Palmerston Street. The 1901 Census lists the family as follows – Henry (50), Fanny (51), Harry (24), Alfred, (20), Helen (18), Amy (16), Arthur (12), Jesse (9) and Bertha (3). Charles had another sister, named Edith, aged 22 years who had left home by 1901. At the time of the census, in 1901 Charles Alfred was employed as a Grocer’s Assistant. In 1903 he married Mary Elizabeth Hill, known as ‘Polly’ and by 1911 they were living at Sedgwick Street, Jacksdale with their only child, Charles Alfred, aged 7. Charles had been promoted to a branch manager employed by the Co-Operative Society. Just before the outbreak of WW1, on 21st July 1914, son Charles, aged 10, died during an influenza epidemic. 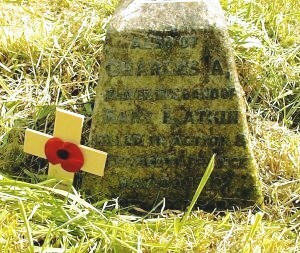 Charles obviously preferred to be known by his second name ‘Alfred’ and is recorded on the Jacksdale Memorial as ‘A’ Atkin. He enlisted at Kimberley, Notts – date unknown. He was killed in action on Thursday 30th May 1918. At the end of April 1918, five divisions of the Commonwealth (then Empire) forces (IX Corps) were posted to the French 6th Army in the Aisne/Marne sector for rest and refit following the German Spring Offensive on the Somme and Lys. Unfortunately, at the end of May, they found themselves facing an overwhelming German attack which pushed the Allies back across the Aisne to the Marne at a loss of 15,000 fatalities. Early August would see the lost ground recovered. In November 1919 the Army sent his widow Mary effects amounting to £10 3s 8d which included a war gratuity of £8 10s. Against this payment record is the annotation ‘presumed dead’. He is commemorated on The Soissons Memorial, which records the names of 3876 war dead in the region with no known grave. Charles is also remembered on his son’s grave in St Mary’s Churchyard, Westwood. Charles Alfred’s younger brother, Lieutenant Jesse Marson Atkin was also killed during WW1 and is listed on the Jacksdale War Memorial. The 1918 Electoral Roll for Sedgwick Street, Jacksdale, lists Private C. A. Atkin as an absent voter. His widow Polly was later to take up residence with relatives on Main Road, Jacksdale, having lost her husband and her only child. 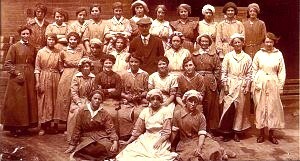 Mary had worked at The James Oakes Pipeyard during WW1. Mary did not re-marry. She died in 1967, aged 86 and is buried at Westwood, St. Mary’s. Charles was awarded the Victory and British War Medals. In November 2001, The Jacksdale Memorial Group were given a medal belonging to Private Atkin with the express wish that it be returned to the nearest living relative. We are privileged to report that the medal was presented to Charles Alfred Atkin’s nephew.